We're talking the whole she-bang here. The Who pudding? The Roast Beast? The singers singing? The Christmas feast? If you hate all this jolliness, we can't blame you in the least. Or perhaps recently you've felt your heart expand (though if it feels like you do have a dose of cardiomegaly, we highly recommend you get checked out). Perhaps a metaphorical expansion: from a previously scrooge-like outlook on the holidays to something far more happy. We can get down with that too. Whether you hate the Christmas spirit, or have recently found yourself enjoying it immensely, this is the Deluxe Grinch mask for you. 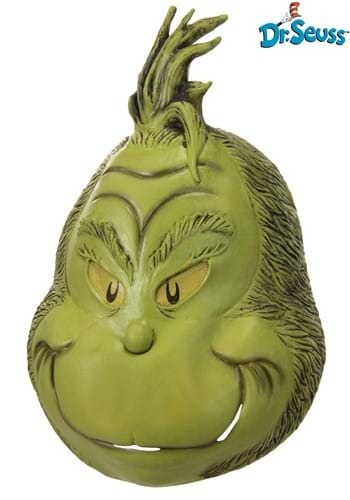 It's a latex molded mask so you can wear the mug of your favorite Who from Whoville. Don't worry, it has holes to hear, eye-mesh to see, merely pop it on and you'll be green as a Christmas tree!